Scrambled Egg with Grilled Asparagus — What the Fruitcake?! I've been making this breakfast long before I changed my diet. Would you believe, I actually saw it on Food Network and not some health blog? Maybe the parmesan cheese gives that away. I mean. Cheese is bad! So so bad! My trainer likes us to start our day with protein and a bit of fat. Sooo... Egg = protein. Cheese = fat. 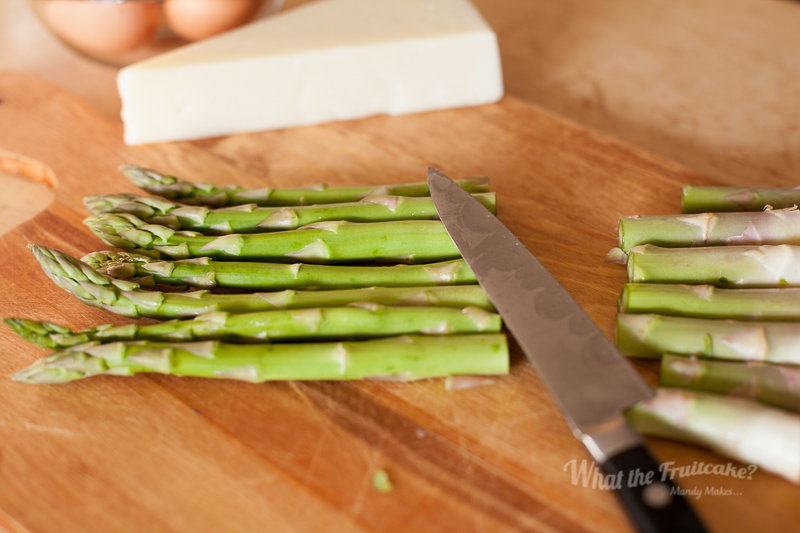 Asparagus = bonus fibre and other good stuff. I think that puts this recipe squarely in the "good" pile, don't you? Now, I know that this is technically breakfast, but since I started with the whole fitness thing, eggs have become a very quick, easy and good source of protein for any meal. I'll have omelettes for dinner or scrambled egg for lunch. Besides, who the heck said that eggs should only be a breakfast item? My point is, this makes a good any time of the day meal, but it's particularly suited for breakfast 'cause of the whole protein/fat thing. But if the cheese is screwing around with your macros, you can simply leave it out 'cause the parmesan is used more as a seasoning rather than a main ingredient. The secret to tender scrambled eggs is to cook them low and slow. It's tempting to bung the heat up so that your eggs cook quicker, but that's when you end up with rubbery egg. The proteins need to be wooed into cooking delicately. When you scare them with high heat, they just curl up into a little ball in the corner and cry and cry (much like me after leg day) and then you end up with tough eggs. True story. Cooking low and slow doesn't mean you'll be at the stove for half an hour, it's still a quick meal. This is one of those recipes that has perfect timing. Grill and pan on to pre-heat. Prep asparagus. Asparagus goes under the grill. A quick beating of eggs. Into the pan. After some leisurely stirring, about ten to fifteen minutes, your asparagus is done and so are your lovely tender eggs. Easy and tasty! Posted on February 28, 2015 by Mandy Mortimer and tagged breakfast Scrambled Egg Asparagus Parmesan Cheese Protein Fat Fibre.